Nastaran received her B.Sc. in Electrical Engineering from Shiraz University, Shiraz, Iran in 2006. She also graduated with M.Sc. degree in Electrical Engineering (Communication Systems), honored as the 1st rank student, from Amirkabir University of Technology, Tehran, Iran in 2009. Her research background is in the field of Signal Processing, Image Processing, and Statistical Signal Processing. 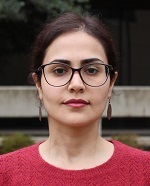 Nastaran has about six years of work experience from being lecturer in university to work as researcher and training expert in the field of data communication network. She is currently a PhD student at the University of Texas at Dallas and is a member of Laboratory for Dynamics and Control of Nanosystems. Her research interest includes High-Speed Atomic Force Microscopy (AFM).